St. Helena recap and photo gallery. The northern tip of Olney — Fifth and Godfrey, to be more precise. Happy Easter! Given its significance on the Christian calendar, it's natural the Project would get in on the action. Where would we venture this year? Back to a church from the Project's past — Olney's St. Helena. I've noted this a couple of times before, but I'll do so here again for full disclosure. 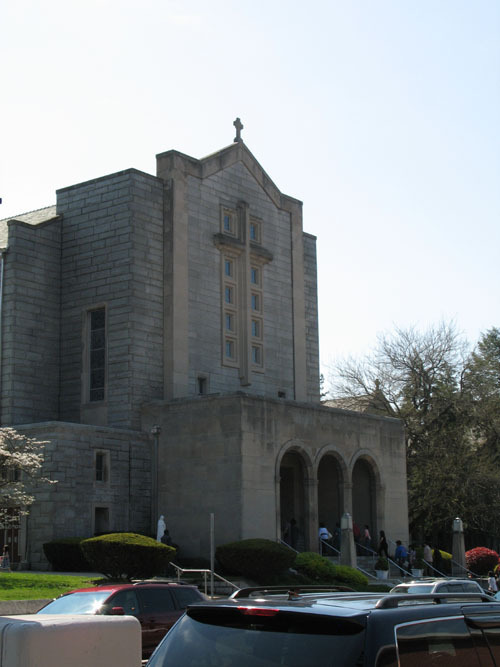 For the first 18 years of life, before the Philadelphia Church Project was even a glimmer in my mind's eye, before I became a wandering nomad to serve the greater good of this area's churches, this was my home parish. Someone's gotta do it, and we can't trust it to an outsider. I never claimed to be impartial in any way, shape or form, as longtime readers are no doubt aware. To be fair I put it off for quite a long time, but too many people keep asking about it, and it's too good a church to leave on the sidelines for so long. Plus, because of their propensity for Upper v. Lower church, Easter Sunday is one of the perfect opportunities to see it. So what can you make of St. Helena? Well, it's the quintessential tweener church. 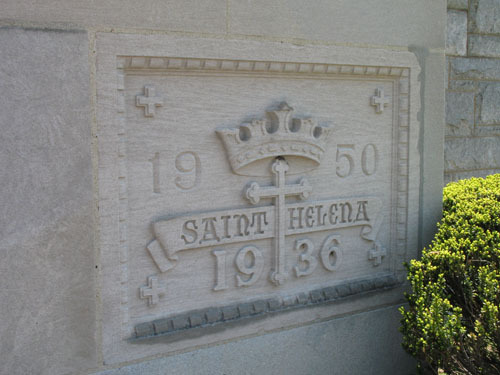 Crafted in 1950, St. Helena is the architectural equivalent of a sledgehammer between the eyes. Not subtle or delicate, but most overpowering. And that's the natural reaction to this hulking granite behemoth. It's big, it's bold, it's loud. It grabs you by the lapels, shakes you viciously, and demands that you pay attention to its grandiosity. To say St. Helena goes all-in on size, then, is something of an understatement, because the ornamentation tends to be pretty spartan, even austere at times. 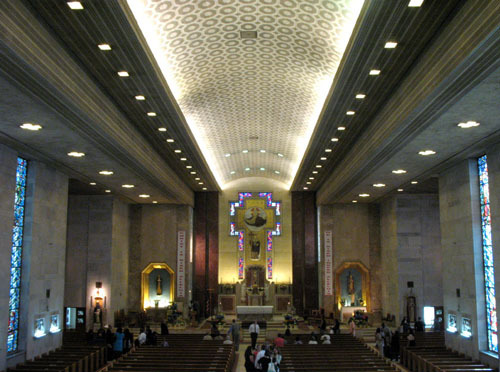 Unadorned granite walls, and a pretty plain, tiled ceiling that's mostly flat save for a barrel-vaulted center. No paintwork, no murals, no stonework or scripting of anything. Just a sheer, imposing granite hunk. That's not to say the place strikes out completely on decor, because it boasts some pretty nifty things. 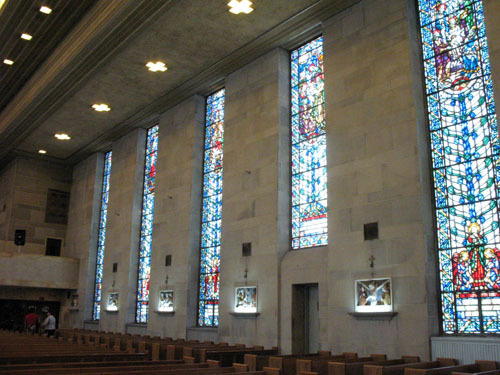 The most noteworthy is the stained glass, which, like the rest of the church, is ridiculously large. 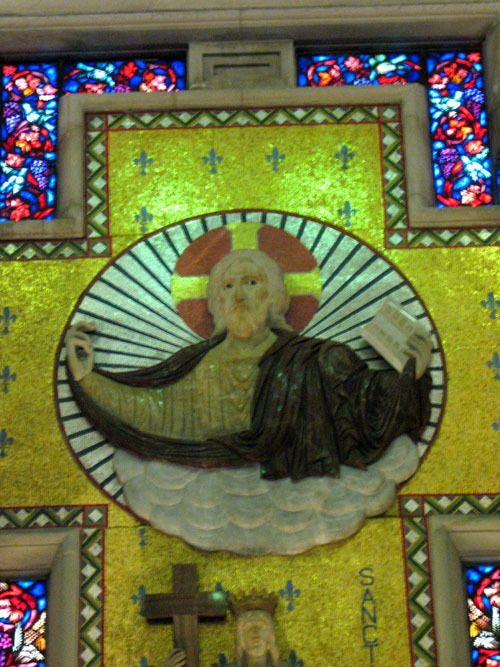 Larger than any of set of stained glass around, actually. 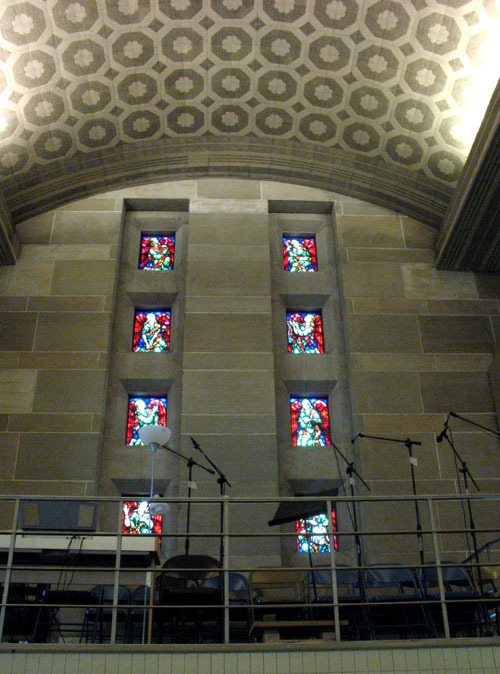 The nave sets stretch nearly from floor to sky-high ceilings, and the transept ones are just as tall while stretching horizontally to cover nearly the entire wall. 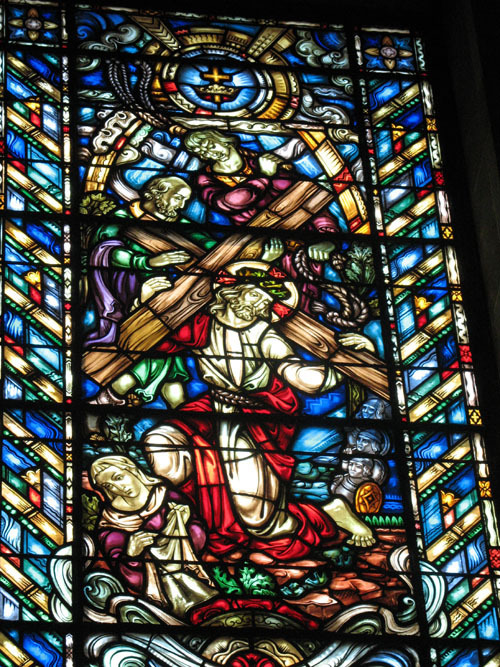 They also happen to be fairly detailed, especially in the transept, and as such are and probably the most accomplished tweener windows around. They're also solidly rectangular, which puts them into the company of another tweener, St. Bartholomew. 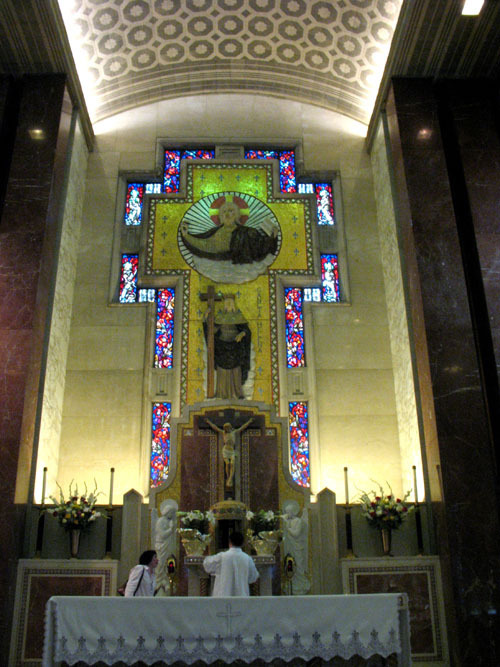 There's more interesting stuff in and around the sanctuary, which boasts four imposing maroon marble columns that frame the altar backdrop, itself a gigantic stained-glass-framed cross with a three-dimensional fresco of God the Father. Pay attention to the eyes--they follow you everywhere. St. Helena also boasts some other firsts, including an elevated walkway from rectory to church, and the large enclosed vestibule that fronts the church. We've seen nothing of the sort before or since. 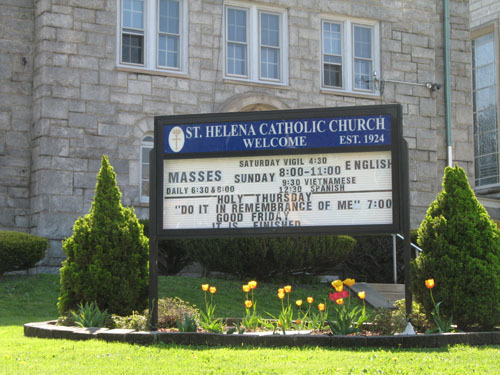 Look for it: The titular St. Helena is renowned for finding the true cross, so it's no surprise this church embraces that motif — from the cross behind the altar to the cross that adorns the face of the church to, yes, even the pronounced cruciform shape. Family Matters: As I noted in Transfiguration of Our Lord, St. Helena is strikingly similar in design and profile to both Transy and St. Martin of Tours. Given that Helena and Martin are a good 20 years older, it's a safe bet that they found some inspiration there. If you want ornamentation, windows aside this probably isn't the place. But if you want pure size, this is your baby. 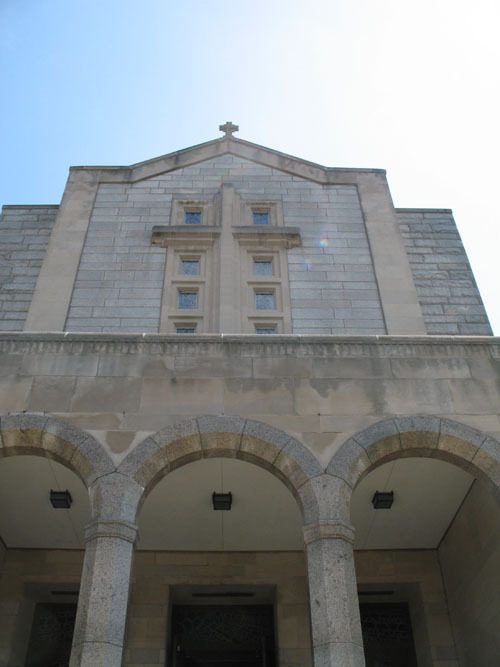 Sure, it's not as big as, say, Immaculate Conception or the Basilica, but it's significantly larger than just about everything else in the city, and you'll get a lot of bang for your buck. Pretty well, as far as urban parishes go, thanks to passionate immigrant populations like the Vietnamese, who helped prop this place up after most of the original Irish and German residents cut bait a couple of decades ago. The registered population has taken a hit in recent years, but the average weekly attendance has held fairly steady in and around 1,000+ or so, so those people were probably deadbeats anyway. Sure, it's a far cry from its oversized 1960s and 1970s heyday, when the parish offered a staggering 14 Sunday masses, but in today's religious world, it's about as good as you can get. It doesn't hurt that the building looks to be in extremely solid shape. 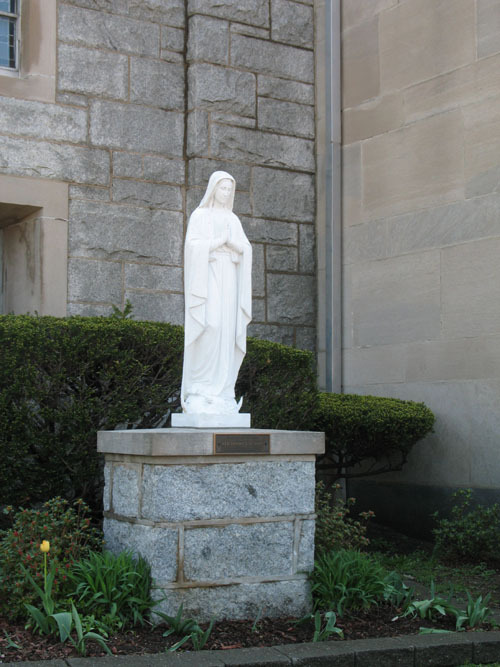 A neighborhood as large and complex as Olney can't be defined by blanket statements, so it's best to let its Catholic parishes — whose boundaries largely define the neighborhood and used to lead to some serious turf wars back in the day — do the talking for us. It's true that the lower sections that front the Boulevard, in and around Incarnation of Our Lord and St. Ambrose, are incredibly diverse but also kind of rundown and even derelict in places. But the upper regions, in and around St. Helena, managed to diversify while still maintaining a pretty good general state of affairs. These parts also benefit from bordering stable East Oak Lane, which, like Olney itself, never fell as far as stupid suburbanites like to think. Add it all up, and you have an area that's teetering in places but not very far gone. 5th & Olney is no 5th & Lehigh, and even its worst parts are laughable compared to some of the crap we've seen. And especially as it concerns visiting St. Helena, you'll have no safety worries. There is a lot by the school, but there's also copious and reliable street parking. 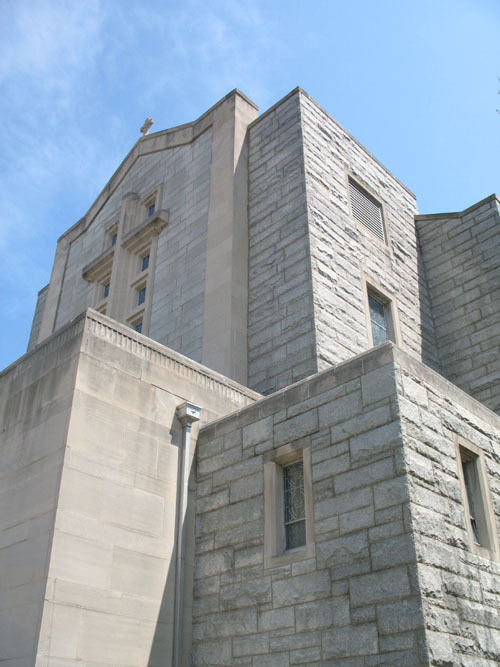 A common Project annoyance is the trend of churches aspiring to a post-Vatican II aesthetic, and trying to change themselves to match. 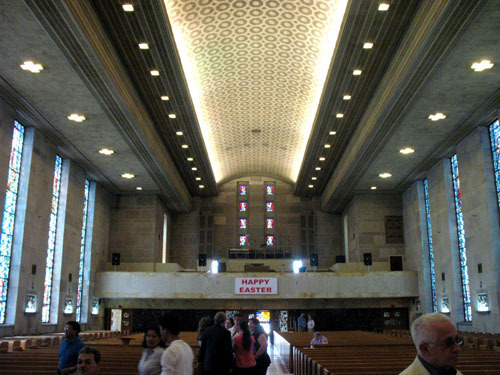 Part of this involves removing the altar rail, which fortunately could never happen here because, in keeping with the rest of the design, it's literally a gigantic slab of marble. No pillars or arches, just a wall of unbreakable marble. There's probably no realistic way to separate it from the sanctuary even if they wanted to. Probably not what the great ecclesiastical architects had in mind, but hey, if it keeps Vatican II at bay, who are we to complain?